Floating decks are so called because, rather than being attached to a building as are standard decks, they simply "float" on top of the ground. They are also called freestanding decks, for the same reason. 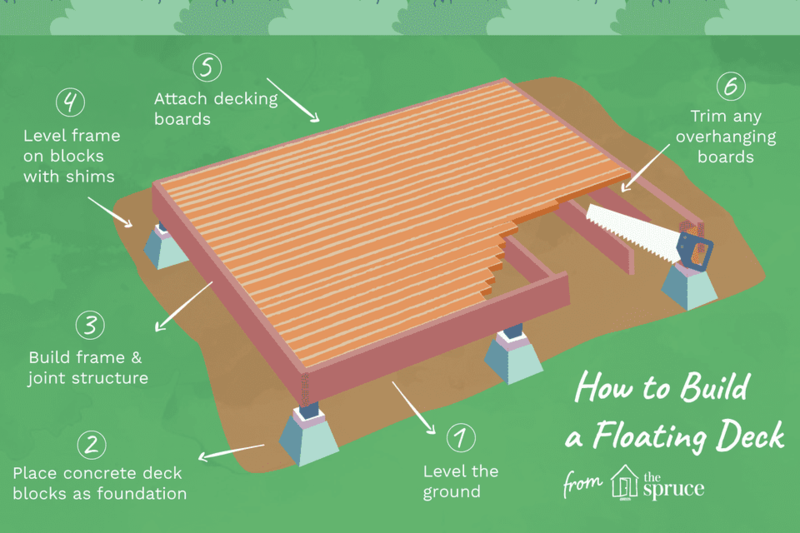 Floating decks are much easier to build than standard attached decks and typically don't require a building permit, especially for a small floating deck. Arrange 21 concrete deck blocks in a rectangle, creating seven rows of three blocks each. Place the four corner blocks so they are 120 inches apart along the long sides of the rectangle and 96 inches apart along the shorts sides, measuring from the centers of the blocks. Arrange the remaining rows of blocks so all are evenly spaced between the corner blocks. Use a level and a straight 10-foot-long board to make sure all of the blocks are level with one another. Clear a flat area of lawn (or use a garage floor or driveway) for building the deck frame. If necessary, you can also build the deck on top of the concrete blocks. Cut nine pressure-treated 2x6 boards to length at 93 inches, using a circular saw or power miter saw; these are the ​standard joists. Place two 10-foot 2x6s (the end joists) over the ends of two of the standard joists to create a 96-inch-by-120-inch rectangle. 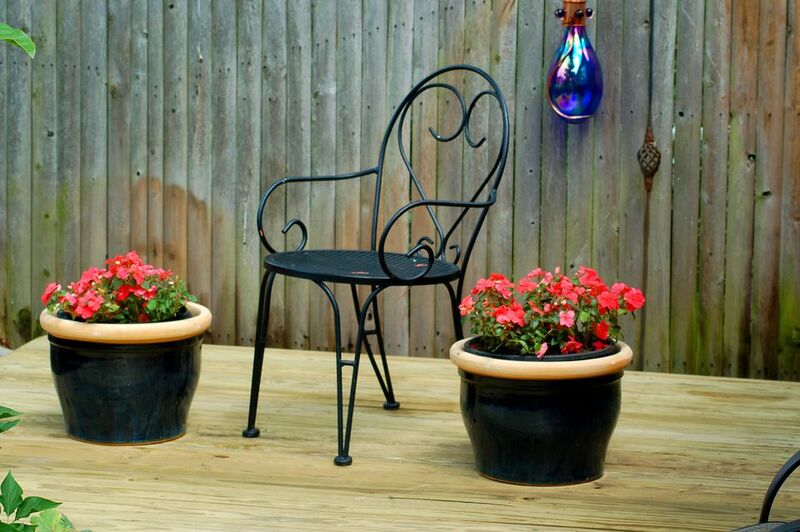 Drill pilot holes, and fasten the pieces together with three 3 1/2-inch deck screws at each corner, using a drill. Measure from the inside of one corner of the frame and make a mark every 19 1/2 inches along one of the 10-foot end joists. Do the same to mark the other end joist. Place a standard joist so it is centered on each pair of lines, making sure the tops of the joists are flush. Drill pilot holes, and fasten through the end joist and into the standard joist with three 3 1/2-inch screws at each end. Place the deck frame onto the concrete blocks so the frame parts rest over the centers of the blocks. Use a framing square to check the corners of the frame for squareness (90-degree angles). Square up the frame, as needed, by pushing diagonally from opposing corners (this takes two people). Re-check with a framing square to ensure the frame is square. Confirm that each concrete block is level and makes solid contact with the deck frame. If necessary, add or remove soil or gravel beneath blocks to adjust their height. Place a 10-foot-long deck board along one long side of the deck frame so it is flush with the side of the frame. Alternatively, you can overhang the frame by 1/2 inch, or so; this will make the gaps between the deck boards slightly wider. Drill pairs of pilot holes aligned with each standard joist, with one hole going into the end joist and one into the standard joist. Position the holes slightly off-center so they won't interfere with the frame screws. Fasten the deck board to the joists with 2 1/2-inch deck screws. Install the next 10-foot deck board with two screws in each standard joist, spacing the two deck boards by about 1/4 inch. Install the remaining deck boards using the same techniques, spacing them evenly apart. What Is a Deck Girder?